The Offshore System’s NMEA2000® part number 4291 4–20mA Tank Level Adaptor is designed to monitor any 4–20mA level sensor including Fuel, Fresh Water, Waste Water, Live Well, Oil & Black Water senders on the NMEA2000® network. The Tank Sender Adaptor is water resistant but NOT waterproof. It is designed to be located in a dry and protected location. 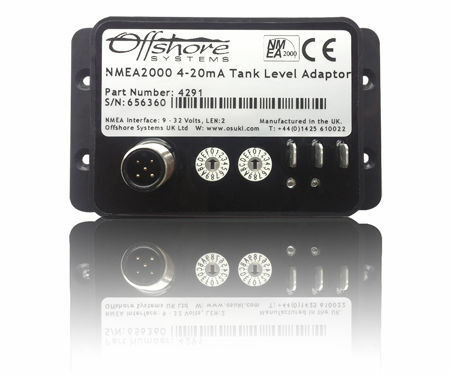 The unit is connected to the NMEA2000® network by the 5 way micro C plug on the front.